Meethi roti is very easy to make and satisfies your craving for sweets as well as fills your stomach as it is made from whole wheat flour. It is liked by both adults and kids. 1. Knead flour adding water into smooth, pliable dough. Let it rest for 1/2 an hour. 2. Take a ball (peda) out of the dough and roll it into a 3 inch round dusting with flour. 3. Spread melted ghee on this roti. Sprinkle 1/2 tsp saunf and 1-2 tsp sugar on it. 4. Gather the edges and reshape into a ball. Roll out again into a 5-6 inch round. 5. 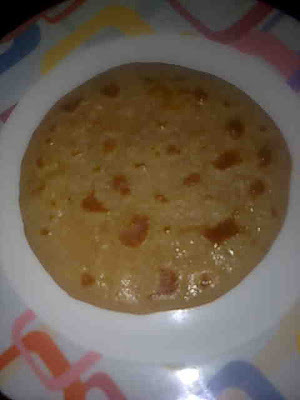 Heat a tawa (griddle) and shallow fry this roti on both sides applying ghee. Fry till golden brown. Similarly make other meethi roti from rest of the dough. Serve hot.